It is widely recognised that more emphasis needs to be given to the role of the patient in making decisions about their health care. But what are the best ways to make this happen? 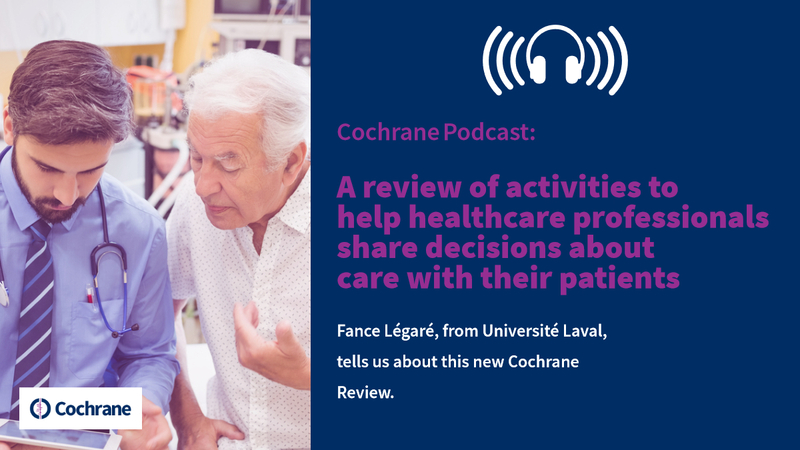 Some of the answers are in the July 2018 update of a Cochrane Review on shared decision making and we asked the lead author, France Légaré from Université Laval in Québec Canada, to tell us why this is important and what they found. "I have been practising family medicine since 1990, and training family physicians for many years. I have seen the many difficult decisions that patients face every day about everything from screening to treatment options, and have always suspected that family physicians could do things differently so they could better support their patients in making decisions. Often, the physician makes the decision for the patient, or the patients make it on their own. But this could be different. Physicians could change how they explain the scientific evidence to the patient. They could help patients discover what’s most important to them personally about the pros and cons of the available options. We call this process shared decision making, and I believe not only that physicians can learn to do it better, but that it’s the ethical thing to do. We did this review to find out about the best ways to encourage healthcare professionals to do this, and have several things to suggest. This is the second update of our review of studies of interventions which include, among other things, training programs, audit and feedback, public campaigns, and patients decision aids. Our first review was published in 2010, when there were just 5 eligible studies. By 2014, 34 more studies were available for our first update, and we’ve now reached 87 studies. The number of studies more than doubled in just five years, probably because of the increased awareness of the importance of shared decision making in medical communities and governments. It’s also encouraging to see that more than half the studies reported on the patient’s awareness of whether shared decision making occurred, showing that more and more researchers are interested in finding out what matters most to patients from the patients’ perspective. However, only one study took place in a low-income country, suggesting that shared decision making is still seen as something for the privileged one. Studies had tested a great many different approaches, and many were found to be effective in increasing shared decision making, especially the use of decision aids. However, when applying Cochrane’s very strict rules about evidence quality we found that few studies met the high standards. For example, many didn’t give enough information to properly judge the quality of the evidence they produced. But, we can say that compared to no activity at all, it is clear that some interventions which aim to implement shared decision making in clinical practices slightly improve patients’ quality of life in terms of mental health, but make little difference to their quality of life in terms of physical health. Having done this update and thinking about its meaning for me as a family physician, I will encourage my patients to use decision aids. And, as an educator, I will encourage health professionals to get training in how to use them. While, as a researcher, I will strongly encourage other researchers to design their studies so that the quality of evidence is better and to agree on a set of measures of shared decision making that would make it easier to compare studies."